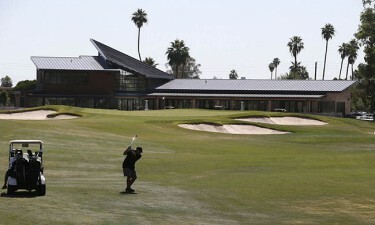 The luxurious new clubhouse, with its Lope House restaurant, is just one of the attractions for golfers at Grand Canyon University Championship Golf Course. 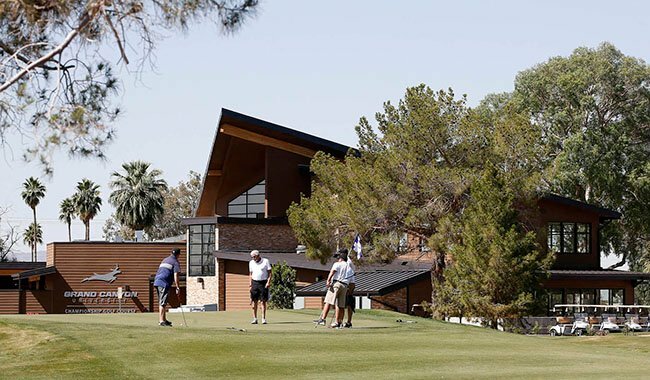 It is as serene a setting as you can imagine, with kids happily participating in a putting contest at the weekly junior golf clinic and parents enjoying the shade of a tree next to the stylish new clubhouse at Grand Canyon University Championship Golf Course. The view from the fairway to the ninth green, with the clubhouse in the background, is of a challenging shot — and it’s even prettier from the opposite direction at sunset. Mona Shelley, whose granddaughter Amelia has been to a number of GCU camps in addition to the golf clinic, is visiting the course for the first time and is stunned by what she sees. The free junior clinic — 4 p.m. every Friday — is just one of the reasons why the transformation of Maryvale Golf Course to the new GCU facility has been such a success in its first 4½ months. Golfers rave about the course’s playability and affordability (and rates will go even lower on June 1 — see gcugolf.com for details). Visitors to the Lope House restaurant rave about the food creations of executive chef Kevin Walton and the view, created by a much higher power. But there’s another factor for longtime residents. There are the Maryvale memories and how good it feels to see it rejuvenated in such spectacular fashion. Case in point: David Gaxiola. “When I was younger, when it was Maryvale, my dad used to bring me here to play golf,” he said. And now his son can’t get enough of it. In fact, those feelings are so strong, it has become a very large, very green driving hazard — the kind of driving you do in a car, not on a golf course. GCU President Brian Mueller said one alumnus told him that he’s so overtaken with emotion every time he drives past the course, he tends to lose track of the traffic around him. The course has its share of challenges, such as the water and massive bunker on the par-3 fourth hole. “He feels so much pride, partly because he’s an alumnus of the institution but mainly because he lives on the west side and he’s proud of where he lives,” Brian Mueller said. “To see this gives him hope. He told me that every time he drives by that golf course he nearly gets in an accident because he’s rubber-necking and looking at it. How much enjoyment? Try on these numbers for size: In its first three months, the new GCU course made almost as much ($949,307) as Maryvale made ($950,000) in all of 2014, its final year before GCU began the renovation, and averaged 5,511 rounds a month in that span, up from 3,041 a month at Maryvale in 2014. It is Brian Mueller’s passion to grow west Phoenix by building strong, attractive businesses, and the golf course and the new Grand Canyon University Hotel are two very important first steps. He wants more people getting gleeful as they drive around the neighborhood near GCU — although the Arizona Department of Transportation probably would appreciate it if they’d keep their eyes on the road. The deep bunkers, all of which were created during the course renovation, offer a solid test. He also wants to give them reasons to be able to work in the neighborhood and have pride in that, too. The idea of taking over Maryvale had many positive implications, for the University as well as for the residents. Then there’s the course itself, which already has hosted several major tournaments, including the Arizona College Football Championship Golf Classic and the Arizona Stroke Play Championship. No matter where you go on the course, there’s a lot to like. Officials of the Stroke Play were so impressed, one of them wrote a letter praising the course and the staff and promising to return. But this is only the start. 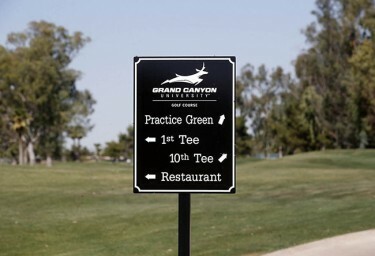 The Arizona Junior Golf Association is moving its tournament to the GCU course, and the Web.com Tour — the steppingstone to the PGA Tour — has expressed strong interest in having an event there. 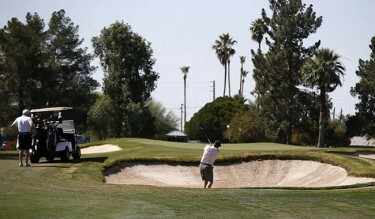 Imagine that: Professional golfers playing at 59th Avenue and Indian School Road. Who says west Phoenix can’t be a popular destination? Jesse Mueller noted that a lot of golfers who live on the east side of the Valley have come to play it, joining local residents who looked fondly at what Maryvale once was. It’s Exhibit A of what GCU is aiming to do in the community. This combination of serenity and Disneyland quickly has become the Happiest Place on the West Side, and the visitors — and the drivers — have spoken: The transformation has been ah-mazing.